Brockville could one day be home to an international centre devoted to sustainable development, working in tandem with Queen’s University and the Aquatarium. While the project is still years away, it’s the objective of a small group of biosphere reserve representatives from five countries meeting at the Aquatarium Thursday through Saturday. The international working group, set up at a previous UNESCO-backed international conference here three years ago, aims to develop a detailed program for research, education and exhibitions at the proposed International Centre for Sustainable Rural Communities (ICSRC), which would be located in Brockville. “The purpose of the meeting, really, is to define the project,” said Gary Clarke, co-chairman of the working group with his European counterpart Andy Bell. The meeting brought together 12 people from Canada, including one First Nations representative, the United States, United Kingdom, Sweden and Spain. Clarke, a past chairman of the local Frontenac Arch Biosphere, is also a director on the board of the Canadian Biosphere Reserves Association. The ICSRC would focus on “research, education and inspiration” in the areas of biodiversity loss, sustainable communities and climate change, said Clarke. While marine biodiversity will not be its exclusive focus, it will have special significance given the city’s location on the St. Lawrence River and the Aquatarium. Clarke cited a recent report concluding that animals in freshwater systems declined by 81 per cent since 1970 on a global scale. He believes such statistics lend urgency to the project. “This is a facility that’s going to carry both the UNESCO brand and that of Queen’s University,” he said. The three-day meeting aims to figure out, among other things, what, specifically, the centre will do in those vast areas of research and education and what revenue sources are available to keep it running. While the centre’s facility may end up too big to fit in the Aquatarium, Brockville’s recently opened marine interpretive centre is a perfect fit for the initiative, Clarke believes. “There are a lot of similarities in mandate,” he said. 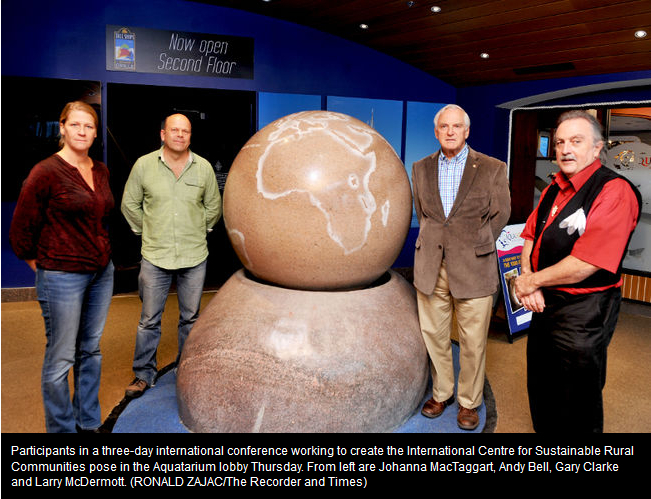 The effort stems from another international conference held in Brockville in October 2013. A meeting of 200 representatives from UNESCO biosphere reserves in 52 countries in Europe and North America, known as the EuroMAB group, backed the proposal, involving the Canadian Biosphere Reserves Association, Queens’s University School of the Environment and the Aquatarium, to develop ICSRC. Clarke and Bell will present a report to the biennial meeting of the EuroMAB group in France in April. Bell, director of the North Devon Biosphere Reserve in England, said the proposed centre is an attempt to take the “rich and fertile” research done locally by the biosphere reserves in EuroMAB’s 52 countries in Europe and North America and share it across those borders. “The opportunity here of some infrastructure can help,” said Bell, referring to the Aquatarium. The Swedish representative, Johanna MacTaggart, also had a good impression of the Aquatarium after touring the facility. “It’s a wonderful facility and it has all the prerequisites. I’m sure that it would be a perfect support system,” she said. The proposed centre will also unite Western science with traditional indigenous knowledge, said conference participant Larry McDermott, of Shabot Obaadjiwan First Nation near Sharbot Lake. “I think there’s lots of examples right now about how we need to bring together our world views to address the most significant challenges to the continuation of life,” said McDermott. The term “deficit spending” means something different from its familiar use when considered in the ecological context, he added. “What we’re doing is destroying Mother Earth’s capacity to sustain life,” said McDermott. “I see the centre as an opportunity for us to sit down and engage,” he added.